Ship structures are determined by the ship’s mission and intended service. These determine a ship’s size, complexity and the function of the structural components. There are inherent uncertainties in the loads imposed on the ship structure because of the random nature of the loads imposed by the marine environment. Unlike a fixed, land-based structure, a ship derives its entire support from the buoyancy provided by a fluid, which transmits these loads to the hull structure. Iron hulls replaced wooden hulls in the second half of the 18th century, to be followed up by steel. Since then seagoing ships and inland barges are being regularly designed with several steel grades and shapes. Steels are the most common materials being used for shipbuilding. These steels are rather to meet strict requirements such as strength, flexibility, high manufacturability, weldability, and cost, reparability, etc. Steels used in the shipbuilding industry also need high cold-resistance, good welding characteristics and increased fracture strength. Modern steel shipbuilding involves the fabrication of a complex steel structure, into which a wide range of ready-made equipment is fixed. Today the principal raw material is steel plate and the layout of a modern shipyard is arranged to facilitate the flow of steel received from the steel plant through the various processes of making out, cutting, bending, welding, fabricating subassemblies, and final erection of the prefabricated units into the hull and the superstructure. In shipbuilding, there is usually a trade off in the use of material and complex structures. Typically, a complex structure requires more labour and fabrication than a simpler structure, which uses more material. There is also a tradeoff between using more complex structure and the lighter weight of the vessel, as a lighter ship can carry more cargo for a given volume, requires less power and therefore fuel to operate. A lighter ship thus provides more revenue for lower operating costs. The simple structure and heavier ship, offsets these benefits by the lower construction man hours and thus labour cost. Shipbuilding traditionally uses structural steel plate to fabricate ship hulls. Modern steel plates have much higher tensile strengths than their predecessors, making them much better suited to the efficient construction of large capacity ships. A ship needs for its construction various types of steels in the form of hot rolled plates, strips, different sections (including hollow sections), flat bars, rods, bars, and tubular products. The ship construction also needs some specialized shapes like bulb plates, unequal legs and unequal thickness angles, and LP (longitudinal profiled) or taper steel plates. 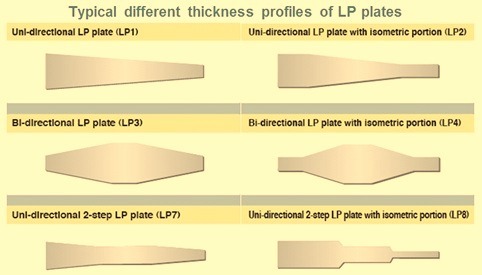 LP steel plates are plates in which the thickness is changed continuously in the longitudinal direction (Fig 1). These are high performance plates which make it possible to reduce the number of welds and steel weight in structures. Unequal legs and unequal thickness angles have an asymmetrical cross-section in the lateral and vertical directions. Hence, for these angles both the material property design and the manufacturing design in the hot rolling process are important. This is realized through high accuracy caliber rolling with 2-hi rolls by applying FEM (Finite Element Method) analysis in addition to the caliber design technology. The rolling process for unequal angle with asymmetrical cross-section by caliber rolling is shown in Fig 2. Several qualities of steels are used for shipbuilding. These are (i) different grades of mild steels, (ii) HSLA (high strength low alloy) steels, (iii) thermo mechanical control process (TMCP) steels, (iv) normalized rolling steels, (v) high strength steels (HSS), (vi) new anti-corrosion steel plates for crude oil tankers which contribute to higher performance in ships through improved corrosion resistance, (vii) clad steel plates for chemical tankers, and (viii) stainless steels. The steels are to meet various shipbuilding requirements, such as reduction in welding man-hours, shortening of welding lines, elimination of cutting steps, stabilization of fabricated part quality and reduction in control costs. Besides this, there is always attempt made in ship design to reduce the structural weight of the ship so that it carrying capacity can be increased. HSLA steel is a type of steel that provides better mechanical properties or greater resistance to corrosion than carbon steel. HSLA steels vary from other steels in that they are not made to meet a specific chemical composition but rather to specific mechanical properties. They have carbon content between 0.05 % to 0.25 % to retain formability and weldability. Other alloying elements include up to 2.0 % manganese and small quantities of copper, nickel, niobium, nitrogen, vanadium, chromium, molybdenum, titanium, calcium, rare earth elements, and zirconium. Copper, titanium, vanadium, and niobium are added for strengthening purposes. These elements are intended to alter the micro structure of carbon steels, which is usually ferrite- perlite aggregate, to produce a very fine dispersion of alloy carbides in an almost pure ferrite matrix. This eliminates the toughness-reducing effect of a pearlitic volume fraction yet maintains and increases the material’s strength by refining the grain size. HSLA steels offer several advantages compared with traditional carbon steels. The advantages of using HSLA steels in ship building are (i) higher strength with good ductility, (ii) micro-alloying yields a fine-grained microstructure, (iii) exhibit good toughness, (iv) good formability at room temperature, (v) good weldability with most conventional welding methods, (vi) lower preheat requirements, and (vii) good corrosion resistance since ferritic microstructure improves general corrosion resistance. The introduction of HSLA steels in specific structural details helps in dealing with the issue of crack initiation and propagation in critical areas of the ship. Thermo mechanical control process (TMCP) is normally used to obtain excellent properties for steel plates such as high strength, excellent toughness along with excellent weldability through maximizing of grain refinement. TMCP steels are commonly used these days for shipbuilding. These steels are having improved combination of strength and toughness properties as compared with the conventional steels. TMCP is a microstructural control technique combining controlled rolling (thermo mechanical rolling) and controlled cooling (accelerated cooling). TMCP steels are sometimes micro alloyed. These steels have almost same formability and weldability compared with mild steels. TMCP steel plates are normally with greater plate thicknesses. TMCP steels gain a high strength by phase transformation, instead of using chemical elements of high cost. There is refined mixed micro structure of ferrite and bainite. The microstructure of TMCP steels is primarily achieved by hot rolling in the non-crystallized temperature region and subsequent accelerated cooling. Generally, TMCP steels are supplied as heavy plates, surface treated plates and plate components. TMCP process is also used for rolling shapes for the ship building. Due to the very low carbon equivalent, TMCP steels are easily weldable using all common processes. In addition, they are easy to form, bend and edge. The use of TMCP steel plates with higher strength has made it possible not only to reduce the weight of the ship but also to apply high speed, high input welding to ship construction because of better weldability and HAZ toughness. TMCP steels have the following monetary advantages for the shipbuilding. Cost savings in welding and fabrication. Normalizing rolling (controlled rolling) is a rolling process involving final forming in a specific temperature range which results in a material condition equivalent to that achieved by normalizing treatment. Thus the desired values of the mechanical properties of steel are preserved even after an additional normalizing treatment. Normalizing rolling consists of two forming sequences. Forming at high temperatures serves the purpose of shaping. Final forming is carried out following a cooling phase. The grain size is minimized through low forming temperatures because grain growth is greatly reduced during recrystallization. The material grain is refined, and the microstructure is homogenized. The material is subsequently cooled. The qualities of steel in normalized formed condition correspond extensively to the properties in normalized annealed condition. Further heat treatment is therefore no longer required. This method is the one most frequently used for steel plates needed for shipbuilding. High strength steels are those steels where the higher strength of the steel is achieved by alloying of the steels with various elements. High strength steels are used for reduction of weight of the ship. For example, high-strength steel is used for blast protection or in submarine pressure hulls. In these cases, using mild steel would require thicker plate or deeper stiffeners, impinging on space constraints and performance. That is, the heavier the vessel the more power is required or the more stability required, causing the need for a wider vessel and a resulting impact on powering and ancillary systems. Normally ships use high-strength steels in the range of around 10 % of the total steel weight for the ship, which is again driven by desire for minimum weight. High-strength steels require preheating before welding and extra care in handling and, including prohibition of temporary attachments. Ships with high strength steels have experienced an acceleration of fatigue cracking. The normal high strength steels used for ship building have yields strength ranging from 315 N/sq mm to 490 N/sq mm and ultimate tensile strength of 440 N/sq mm to 740 N/sq mm. The area under the upper deck in crude oil tankers is exposed to mixed atmosphere of exhaust gas and H2S volatilized from the crude oil. As this area is also subject to cyclic condensation and evaporation of sulphur during day and night, a type of corrosion peculiar to the under deck area, called ‘vapour space corrosion’, occurs. The average corrosion rate in vapour space is about 0.1 mm/annum. However, considering the life of a crude oil tanker to be around 20 years, there is a high possibility of deck plate needing replacement. Without replacement of deck plate which cost is very expensive, the resulting ship reliability may be lower. For this purpose Japanese steel makers have developed a new anti-corrosion steel for crude oil tankers, that can extend the service life of deck plates by approximately 5 years, with the use of ship primer. This steel also has excellent weldability, which is an essential property in shipbuilding materials. Clad steel is a type of composite steel plate in which stainless steel plates or other material (called cladding or clad material) is bonded to one or both sides of a carbon steel or low alloy steel plate (base material). Accordingly, while clad plates possess the strength required in structural members (function of base material), they simultaneously have corrosion resistance or other functions (function of cladding), and are therefore a high performance material with properties which would be difficult to realize in a single material. The cargo tanks are constructed from duplex stainless steel which is a higher grade of stainless steel as opposed to austenitic grade that is often used for inland navigation tankers. Duplex stainless steel is used in shipbuilding increasingly because of its good mechanical properties and marked corrosion resistance. This stainless steel has a higher strength combined with a favourable corrosion resistance (excellent stress and pitting corrosion), two properties that have governed the choice of this material as a way of increasing the number of chemical products that can be loaded and transported by the chemical tankers. Duplex stainless steel has a two phase structure (austenite-ferrite) which is sensitive on heat input during welding because of the possible ferritisation appearance, that is, increase in ferrite content in the area of heat affected zone (HAZ) which can lead to loss of mechanical and corrosion properties. Work with duplex stainless steel requires special attention in every phase of production process, from storage, material handling, up to welding and welded joint surface treatment, in order to achieve a high quality welded joint and assure long-lasting corrosion resistance of the structure.The corrosion resistance can be calculated and expressed by the Pitting Resistance Equivalent (PRE), adjusted for nitrogen containing stainless steel. (PREN = % Cr + 3.3* % Mo + 16* % N). Duplex stainless steel also has excellent weldability. The general characteristics of steels used in shipbuilding are as follows. All steels used for shipbuilding are to have a smooth rolled surface and are to be free from any defects liable to have more than an insignificantly adverse effect on their workability and intended use, e.g. laminations, cracks, blow holes, scabs and seams etc. Surface defects may only be removed by grinding within the permitted tolerance on the minimum thickness. The depressions caused by grinding are to have a smooth transition to the surrounding surface of the steel product. Steel plates, strips, wide flats, and clad plates are to be with the permitted minus tolerances or with no minus tolerance. The limit values specified in the specifications for the chemical composition apply to the melt analysis. Minor positive or negative excesses beyond the limit values, established by analysis of the steel product, are acceptable provided that they do not impair the properties of the steel product and/or the tolerances specified in the other relevant standards are not exceeded. Steels conforming to the specifications are to be weldable by established workshop methods. Where applicable, this includes the measures necessary to ensure the quality of the welds, e.g. preheating and/or post weld heat treatments. The mechanical properties of the steels as stated in the specifications are to be verified by means of tensile tests. The notch impact energy specified for the individual steels is to be fulfilled by the average value of three specimens, one of which may produce a value below, though not less than 70 % of, the average value. Where special properties such as resistance to inter-crystalline corrosion, resistance to brittle fracture or high-temperature strength are prescribed for certain groups of steel products, these shall be proved by appropriate tests, as necessary. Though carbon equivalent (Ceq) is an important property of steel for determining its weldability, in shipbuilding grades of steels, rather than using the carbon equivalent value when assessing weldability, the Pcm-value (susceptibility to cold cracking) is also usually being calculated based on the formula Pcm = % C + % Si/30 + % Mn/20 + % Cu/20 + % Ni/60 + % Cr/20 + % Mo/15 + % V/10 +5* % B. Carbon equivalent, Ceq value for shipbuilding steels is determined by the formula Ceq = % C + % Mn/6 + (% Cr + % Mo + % V)/5 + ( % Ni + % Cu)/15.